TORONTO, ON – After months of renovations and a few weeks of playing host to several private and industry events, the Beer Academy – the street-front HQ of Molson‘s Six Pints Specialty Beer Company – is officially open to the public starting today Wednesday June 20th. Following on a soft opening this weekend during which an on-site brewed Porter was being sampled along with several beers from Creemore Springs Brewery (a Molson-owned brewery that also falls under the Six Pints umbrella), the tasting room line-up will be expanding this week to include Kölsch Golden Ale, Dunkel Weisse, Belgian Brown Ale and India Pale Ale. In addition to tasting samples, the beers will be available to take home in growlers and quart bottles. Along with the tasting room and retail store, the Beer Academy also features a beer education area where visitors can view an assortment of breweriana and learn about the history of beer and brewing. The Beer Academy is located at 75 Victoria Street in downtown Toronto. 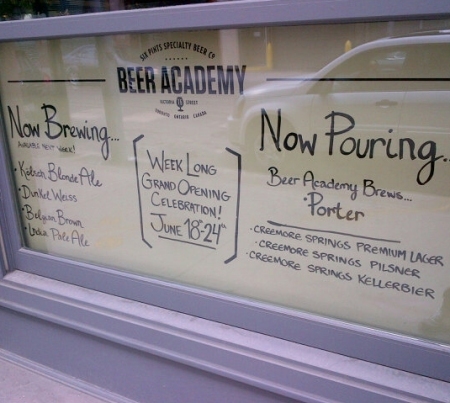 For more details of the grand opening week, see the Beer Academy’s Twitter feed. UPDATE: As noted by the edit above, The Beer Academy has announced that their official grand opening has been delayed to Wednesday June 20th. Opening hours this week will be 12:00 noon to 7:00 PM on Wednesday and Thursday; 11:00 AM to 9:00 PM on Friday and Saturday; and 12:00 noon to 6:00 pm on Sunday. Regular business hours starting next week will be 12:00 noon to 7:00 PM on Monday to Wednesday; 11:00 AM to 9:00 PM on Thursday to Saturday; and 12:00 noon to 6:00 pm on Sundays. This is just a front for boring, lame lagers that Molson pushes.